Convert your Epson Photo 1400 or Artisan 1430 into a sublimation printer . Use bulk ink for significant savings over regular cartridges. Includes two sets of refillable cartridges. Supplied complete with discounted set of bulk inks. Kits include a sample pack of Sublim8 transfer paper. Supported by free ICC color profiles. Ink cost per cartridge only $ 3.44. 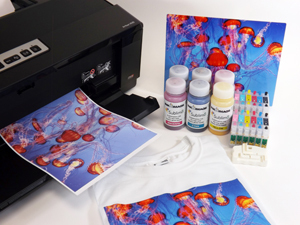 The Epson Photo 1400 and Artisan 1430 are perfect printers for medium format sublimation printing – 6 color, low cost, and able to print up to 13” wide for T-shirt production. Our Sublim8 refillable cartridge system is supplied in a kit that includes a set of 6 x 4 oz bottles of Sublim8 sublimation ink and two sets of refillable ink tanks. Featuring the same spongeless design as the original cartridges, these ink tanks are simply refilled using the included syringes when they run empty. The ink level monitor chips on the tanks automatically reset to full when a tank has run empty and is refilled. The kits come with two complete sets of refillable tanks so that you can always have a filled tank ready to go into the printer, which means that you never have to stop printing to refill a tank. The kit also comes with a manual chip resetter so that the cartridge chips can be reset to full without waiting for the chips to run to empty – a very useful feature if you want to refill the cartridges to full before starting a big print run. Cost savings are around 70% compared to normal cartridges. The kit includes full instructions and all necessary refilling accessories, plus a starter pack of our Sublim8 sublimation paper. The refillable tanks can be refilled many times and are guaranteed to last for at least the number of refills provided by the included 4 oz bottles. Both refill bottles of ink and empty tanks are available separately. Each 4 oz bottle contains enough ink to refill a tank eight times. If you are installing our Sublim8 sublimation inks on a brand new 1400 or 1430 machine, or on a printer that has been running the original Epson OEM inks, then there is no need to clean out the original inks before installation – just run 3-4 cleaning cycles after installing Sublim8 inks and you are good to go. If your printer has been running different inks or another brand of sublimation inks, then we recommend cleaning out your printer using our Sublim8 cleaning kit before installation of our inks. This will prevent any possible reaction between the two ink types which can lead to clogged jets or color issues. The Sublim8 cleaning kit can be found by clicking here. All kits are supported with complete installation guides and usage instructions (see link below), and free ICC color profiles ensure great color prints – see our sublimation support pages. For additional bottles of ink, click here. For extra or replacement cartridges, click on the link below.